Throughout his career, Mika Anttonen has successfully used innovative thinking to build a very successful business, and is a star example of entrepreneurship. It is easy to agree with Mika on a number of points, such as on the need to improve the position of women in developing countries and the necessary role for regulation on climate change. However, the argument he often presents against the electrification of transportation is incomplete and does not take into consideration the very spirit of entrepreneurship that has elevated him to the position he is now in. When developing the argument for the continued consumption of oil products regardless of any advancement in technology, it appears as if Mika has developed his thoughts under the false pretence of ‘ceterus paribus’ or ‘all else being equal’. Anttonen argues that a reduction in the consumption of gas and diesel will not reduce the demand for crude oil because of growing air traffic demand for kerosene and increased demand from the chemical industry for more oil products. In his opinion, these factors would therefore guarantee that all available crude oil will be refined. Such an argument relies on consumers in developing countries to continue using the petrol and diesel that will be available as a ‘by-product’ of the kerosene and pick up the decreased demand created by those of us using Electric Vehicles (EV). Technology is not finite, it evolves as we continue to move it forward. I appreciate that the oil industry is influenced by complex production and economic factors, and that Mika Anttonen knows energy data well. However, it is certain that the energy market of the future will be very different from that of today, and that the development of societies is also driven by other factors than the economics of oil refining. The ‘ceterus paribus’ fallacy is present in several institutions who are comfortable under the status quo and who would therefore argue for its continued existence. However, taking the past as an example, it is impossible to see how all else does remain equal. Technology is not finite, it evolves as we continue to move it forward. It is essential to understand that the desired distributed renewable generation, electrification of transportation and changing consumer behavior, go hand-in-hand. Mika’s career is a prime example of how industries in fact do evolve and that the status quo is not permanent, but merely created by those who have a higher vision for the future. We agree with Anttonen that the demand for oil from air traffic, heavy traffic and from the petrochemicals industry looks strong also in the future, and that the oil industry’s production volumes will continue to be very large despite the direction the automobile industry takes. However, the electrification of light transportation will create a market of alternatives, as will renewables and incentives for distributed energy generation where solar power has a major role. It is essential to understand that the desired distributed renewable generation, electrification of transportation and changing consumer behavior, go hand-in-hand. The change in energy system is a project of such magnitude that all means are needed. Mika Anttonen demands change in consumer behavior and says that “we cannot continue like this”. But it is exactly through creating alternatives for citizens to produce, store, demand/respond and choose an electric vehicle instead of a combustion engine that we create a good energy system. The change in energy system is a project of such magnitude that all means are needed, and that includes also Anttonen’s biofuels. However, biofuels should be reserved for heavy transportation without the mixing obligation for all transportation fuels. On a global scale, preserving biodiversity and food production are by far more important uses for soil than energy production. In 1961, President Kennedy promised to put man on the moon by then end of the decade, and the technology did not exist at the time — 7 years later man walked on the moon. Mika Anttonen also says that “we must not say to people that there are solutions when they do not exist” and I agree. We should not rely on technologies that aren’t available today. However, when it comes to progress we should not be limited by what is possible today, and resist what will come tomorrow. In 1961, President Kennedy promised to put man on the moon by then end of the decade, and the technology did not exist at the time — 7 years later man walked on the moon. The energy sector is going through a massive transformation where scientists, entrepreneurs, regulators and capital are together building a new energy system, and the centerpiece of that new energy system will not be the oil refining industry using every last drop of crude oil on earth the way that Mika Anttonen argues. The easiest path will not be a reliance on fossil fuels. Mika Antonnen completes his arguments by saying: “When we look at population levels we cannot expect anything else but mankind taking the easiest path, and not carrying any additional burden than they have to”. It can be easy to believe that the path of least resistance is the continued use of crude oil products, and that humans will not change until they are forced to come up with an alternative. However, progress is not standardized over continents. As the available technology changes, the third world will not experience the same path to growth as we have. Therefore, it is fully reasonable to think that a child born in Vietnam today will never own a gas-powered car or motorcycle. The easiest path will not be a reliance on fossil fuels. 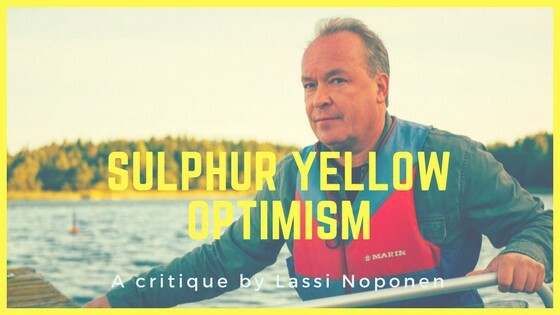 Mika Anttonen says that he is an optimist but his optimism is (to paraphrase Kjäll Westö) ‘sulfur yellow’. Replacing combustion engines reduces our reliance on fossil fuels and it is a big step towards a data driven society where intelligence has a growing role, as opposed to the raw power of fossil fuels. In this world many Finnish companies have excellent possibilities to succeed.